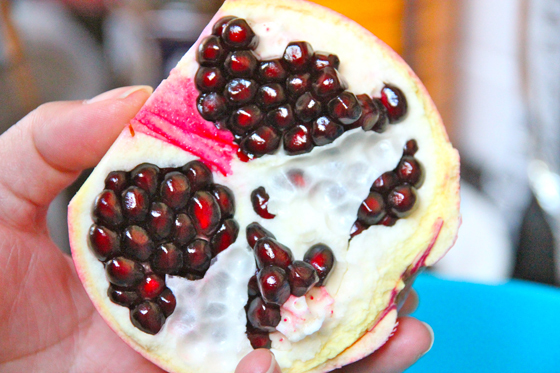 Pomegranates are a rare treat for me. 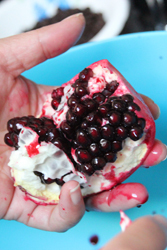 I have fond memories of growing up and sharing a pomegranate with the neighborhood kids, our fingers and mouths getting stained with the fantastically tart and sweet juice – always eating them outside because I’m sure our parents made us – too much of a mess to eat indoors. 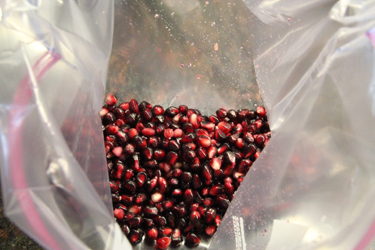 The fact that pomegranates are so messy is probably why I have these vivid memories – we didn’t get to eat them much as kids – and aside from maybe a few precious and beautiful arils (seeds) sprinkled on a fancy salad in a nice restaurant, until yesterday when we were lucky enough to receive a windfall of them from Nick’s uncle’s tree, I hadn’t gotten to enjoy a fresh pomegranate in years. 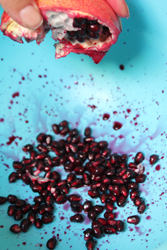 As a kid, we’d just split up the pomegranate somewhat evenly between whoever was sharing and dig in – the juice stains were just part of the territory, and we’d never had that many seeds to ourselves anyway so the mess wasn’t that big (of course our parents might disagree). 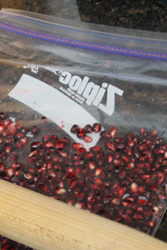 But we got a small box full of pomegranates last night, so I decided to figure out the best way to harvest the arils with the least amount of mess and juice loss. 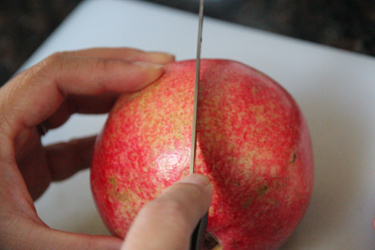 First, I tried a method from Martha Stewart from a video I found on YouTube (hilarious) and started by cutting the top off a pomegranate, then scoring the outside into quarters. 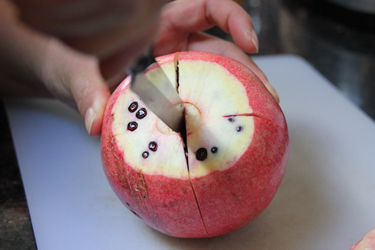 Then I inserted my knife into the top of the “core” of membrane, and twisted a bit to separate the pomegranate without bursting too many arils. Beautiful! 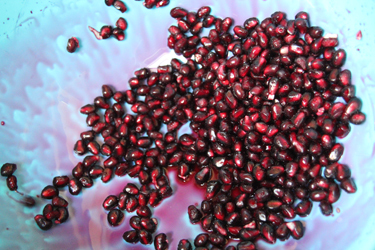 Martha’s method was to hold the pomegranate, seeds-side-down over a bowl, and to whack the back with a spoon. 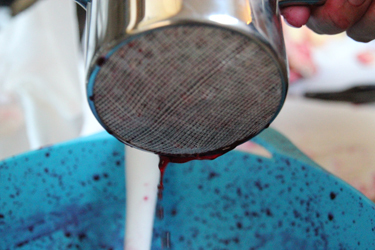 Arils fell out, but there was a lot of juice spurt as well. A bit “Dexter-ish” if you ask me. What a beautiful color though, huh? Especially in the blue bowl. Time to juice. 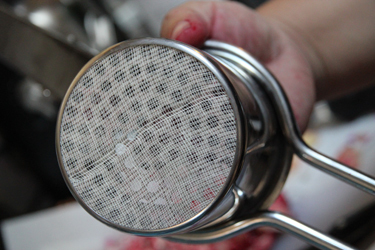 I lined a potato ricer with some cheesecloth since the seeds are actually small enough to pass through the holes, and filled it about a third of the way full. Squish! Oh yeah. Super Dexter-ish. 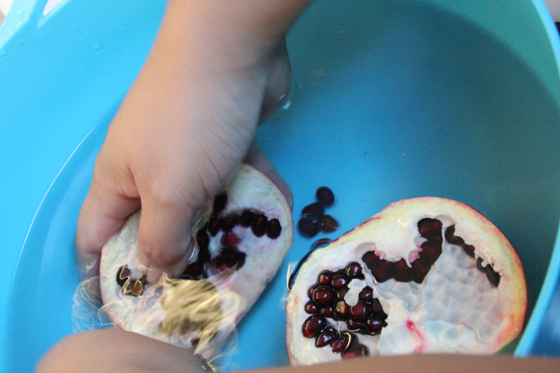 I then tried the “underwater” method of removing the seeds. 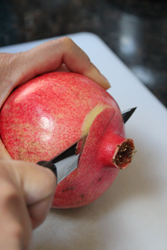 Basically instead of whacking them out of the skin, you brush them out and away with your fingers, but in a bowl of water so it doesn’t make a mess. There was still some breakage of the occasional aril; this was a bit more “Jaws” and less “Dexter” – ha! But this way it really did seem like there was less juice lost. 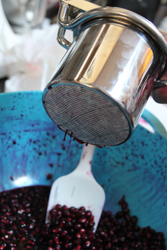 Squeezing and refilling that potato ricer was a pain, especially for the amount of juice that came out in each press. I also felt like I was missing some pulp and juice that way. 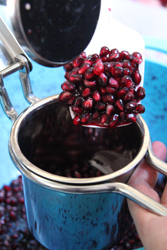 I had read that the more common way is to put the arils in a blender or food processor and pulse them to break up the flesh, then strain them, but that sometimes the juice can get a little bitterness “due to abrasion of the seeds,” and a little cloudier juice could result. I didn’t want that, so I went with another technique I read about – putting the arils in a freezer bag and crushing them with a rolling pin. This worked great. I used the rolling pin to crush the majority of the arils, and then actually used my fingers to make sure they were all pretty squished. It’s like popping bubble wrap, but even more satisfying. I swear! You should try it. 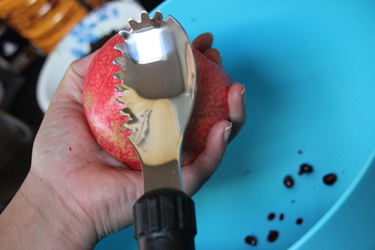 Not only are you getting the squishing satisfaction, but with each squish you know you’re releasing the wonderful, sweet-tart juice. 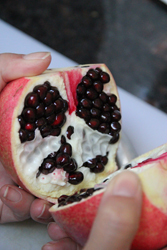 If you know anyone who has a pomegranate tree, let them know you’d be happy to take the fruit they can’t use – it took me about three pomegranates to get 1 cup of juice, but holy moly it was worth it. 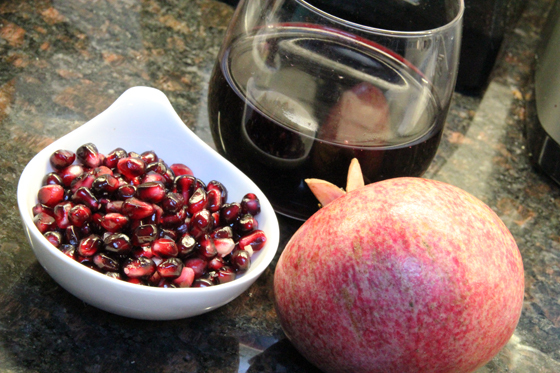 I had over a dozen pomegranates, so I juiced about seven of them for a recipe that called for two cups worth, shared some of the rest of the juice straight, and I had some mixed with a little bubbly for a pomegranate mimosa to reward all my hard work. It was wonderful. Cheers! 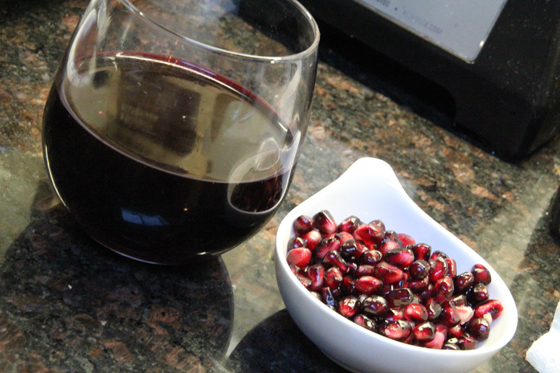 Where was I when the pomegranate mimosa was served?